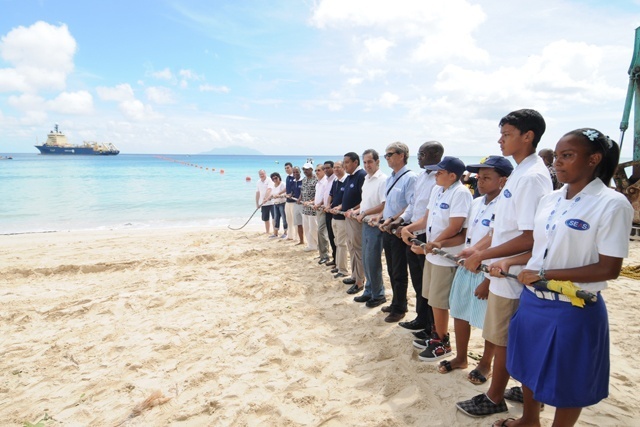 (Seychelles News Agency) - Seychelles will be connected to the Pakistan East Africa Cable Express (PEACE) by a submarine cable system following the signing of contractual documents, State House said on Wednesday. The signing, witnessed by the island nation’s President Danny Faure, took place on Wednesday in Beijing between the Seychelles Cable Systems Company (SCS), Huawei Marine Networks, Peace Cable International Networks and Huawei International. Work on the project is expected to start in 2019, with completion in 2020. Benjamin Choppy, the principal secretary of the Department of Information Communication and Technology, said the contract marks the start of achieving one of the department’s strategic national infrastructure projects. “With the second submarine cable link to the country, we achieve our long-desired goal of security in our international telecommunications link. Connectivity to the rest of the world is indispensable for a small island developing state like Seychelles,” said Choppy. Currently, the Seychelles archipelago in the western Indian Ocean has only one fibre-optic cable, built under the Seychelles East Africa System (SEAS) connecting the main island -- Mahe -- to Dar es Salaam, Tanzania. The Seychelles East Africa System, which was built in 2012, supports over 90 percent of internet traffic in the country with the amount on the satellite being minimal. During his 2018 State of the Nation Address, Faure, said that “in case of an accident with the first cable, [the second cable] provides an alternative route." Mid-January this year telecommunication services in the country were interrupted for close to half a day due to civil work carried out in Dar es Salaam. On his part, the chief executive of Huawei Sri Lanka, Shunli Wang, said that the agreement with the Seychelles Cable Systems fits perfectly with Huawei’s vision and mission of digital connectivity for the world. “Huawei is committed to bringing connectivity to every home, including the beautiful Seychelles, and we are very excited to see the benefits that this project will bring,” said Wang.